Eaton Canyon is nestled in the foothills of the San Gabriel Mountains, just hop, skip and a jump from Los Angeles, on the north-eastern side of Pasadena and Altadena. There are a number of hiking trails meandering there way through these hills, but the one I particularly want to feature in this post is the trail that leads to Eaton Canyon Falls. 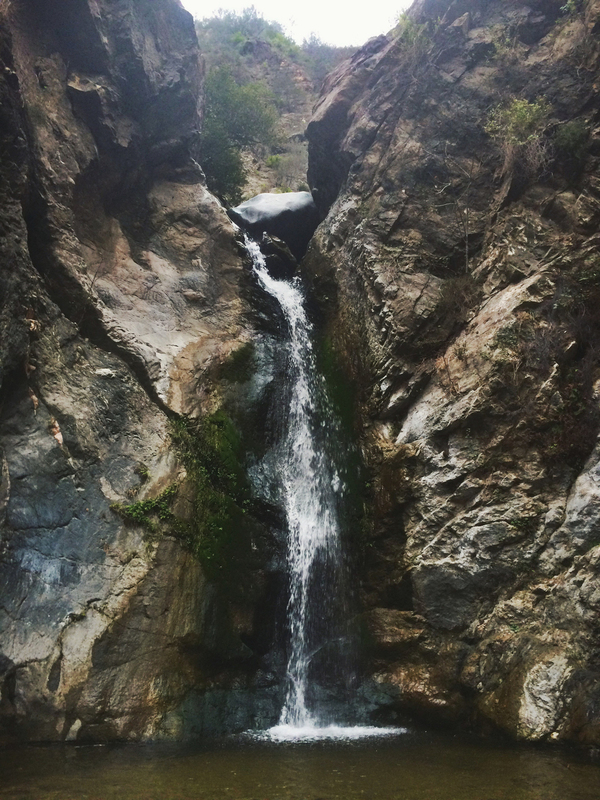 The magnificent forty-foot falls lie at the top of Eaton Canyon Trail, cascading into a beautiful, vast pool below. In the summertime, while it can be extremely busy, I can imagine this pool would be incredibly refreshing to wade or lie in - you could even pack a picnic and relax amongst the large boulders scattered throughout. The trail to Eaton Canyon Falls is fairly straight forward and can be easily be summed up through about 1 miles of wide flat dirt trail, followed by 0.65 miles of single track, rocky creek bed that makes it's way up the slender canyon that is a whole lot of fun to navigate. In total, this trail is about 3.5 - 4 miles (depending how much exploring you do) out and back with a slight elevation gain of about 580 feet (again this depends on your exploration). The hike begins at the Eaton Canyon Nature Center which is situated inside the gates amongst the parking lot. Between the picnic areas, nature center and flat terrain this specific location is a hot spot for dog walkers, baby strollers and families with young children. If you are in search of a serene, quiet experience in nature, I definitely recommend exploring this area on a weekday as opposed to a weekend. We went on a cooler, overcast day in February and still there was rarely a moment that we were alone on the trail or at the falls. There is a large sign marking the start of the trail, you can't miss it! Follow the trail along a usually dry creek bed, Eaton Wash. You'll find yourself amongst a few shaded areas and some little tree hideouts as you make your way up the trail. The trail crosses over Eaton Wash after about 0.2 miles into your hike. At this point you will make a left, heading northwest under a canopy of trees. Around 0.55 miles in from your start, you will find yourself at a junction with the Horse Trail (you will notice signs). Continue to the left to stay on the Eaton Canyon Trail. At just about the 1.1 mile mark in your hike, you will reach another junction which is just in sight of a concrete bridge up ahead in the distance. Here, head left again following an arrow for the waterfall, and pass below the bridge to enter the San Gabriel Mountains. Passing under the bridge turns your hike into a whole different experience. Suddenly you will be traversing much more rugged terrain, boulder hopping, and creek crossing as you make your way through the dense canyon. While this section is quite fun, it can also be unassumingly dangerous - make sure you watch your footing and keep an eye out for falling rocks from above the steep walls of the canyon. Eaton Canyon is infamous for it's helicopter rescues due to careless hiking. After just about 0.6 miles you will find yourself coming upon the falls. You might have to do a bit of scrambling to get up close, but the views are certainly worth it! If you're lucky you might get a moment to yourself at the falls. We were not so lucky, but still happy to be face to face with a flowing waterfall. It's a rare sight these days due to the common droughts, but thankfully, these last few weeks we've had some decent rainfall. While the heavy traffic can be daunting, it's a must see trail nonetheless. With it's close proximity to the city, large parking area, easy to navigate trails and a rewarding ending, you really have no reason NOT to check this trail out! When you're done taking in the views, simply head back the way you came! How to get there: Take the Altadena exit off the 210 Freeway in Pasadena. Head north on Altadena Drive. The Eaton Canyon Nature Area is a couple miles up the road on the right. Pull into the park past the gates, and leave your vehicle in the lot by the nature center. WARNING: The parking lot gate closes at 5pm (a little early if you ask me!) so if you plan on hiking past 5pm, make sure you park your car on the outside street and use the trails to get inside. warning: some of the below photos were taken with a Blackberry circa 2011 - don't judge me. Just over three years ago Ashley, one of my dearest friends from back home in the midwest, called me up out of the blue. Ashley has been my best adventure buddy from day one. This chick is always up for anything and probably the easiest person on earth to travel with. But I digress... Ashley and I talk pretty regularly, but we mainly stay in touch through text and social media - so when Ashley officially calls me up out of nowhere, it typically means there is an adventure in store. And there was. Ashley called to tell me that a couple mutual friends of ours, now living in Los Angeles, were planning a bungee jumping excursion. She said to me, "If I drop everything and fly to LA to bungee jump, will you come with me?" 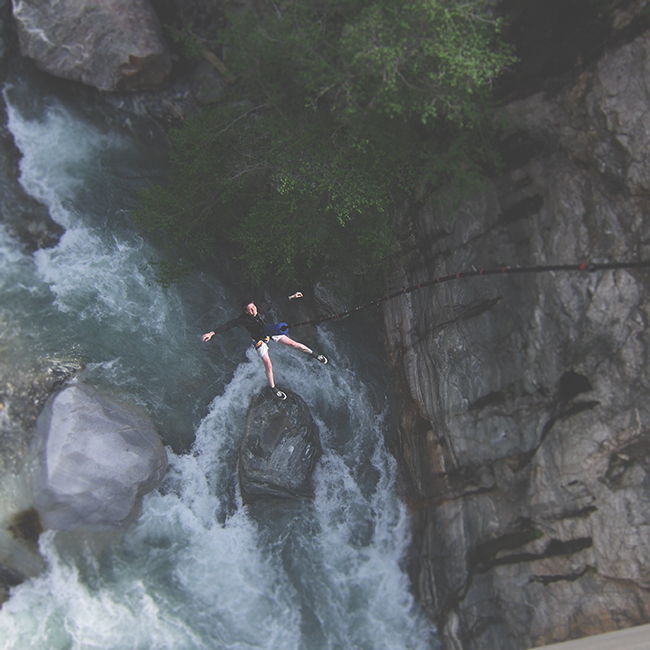 Now, I'm pretty fearless - but bungee jumping is one thing I said I would never do. I've always said I will jump out of a plane or go into space before bungee jumping (don't ask me why). But Ashley is super persuasive and somehow she managed to get me to agree right there on the spot. By the time Ashley flew out to meet me, I still didn't know much about this excursion other than we're hiking to some bridge somewhere and jumping off of it. So we woke up at 4am on Saturday morning, gathered some snacks and our packs and head to meet the rest of the group in Silverlake before driving off into the San Gabriel Mountains. At this point the sun hadn't even made it's way up, it's pitch black, our GPS had lost signal (thank god for paper printed back up directions) and we were winding up through the mountains to what - we weren't completely sure. Eventually, just as the sun came peaking up through the mountain tops, we found ourselves at the Bridge to Nowhere parking lot with the rest of our gang and the Bungee America staff (who we booked the trip with - they're amazing). Here we purchased our vehicle passes and signed our consent forms before heading off on the 5 mile hike to the bridge. 6am at the Bridge to Nowhere Trail Head where we met with our hiking group. Typically, this hike is pretty mild - people bring their dogs or even kids (as spectators), and you pass in and out of exposed and shaded areas. We were told we'd be crossing the river a few times, so we'd get a little wet, but the water is typically only 1-3 feet deep so it was nothing to worry about. The 5 mile trip to the bridge was estimated to take us only about 2 hours. Well, on this particular day in April it happened to be very hot, which meant the snow caps on the mountains had melted, and in turn the river had risen to about 4-5 feet and had suddenly turned into intense rushing rapids. Although no one was expecting those types of conditions, our trail guides were smart and well prepared. When we reached the first crossing we were all a bit anxious. The water was so high, so fast and so cold. Our guides had to tether a rope from a tree on the opposite bank so we could cross without being swept away. The rope our guides tethered across the water to help us cross. As I said earlier, the water was everything we didn't want it to be - I remember one girl slipping and almost losing her shorts as she hung on to the rope. At one point, we came to a crossing that made our guides especially nervous, so they gave us an option: they could either take us back, or we could trust them enough to climb along the edge of a steep wall about 10 feet up above the river. We had come too far, and quite honestly, were having too much fun, to turn back so we trusted our guides. The boys climbed along the side of the cliff and nailed a guide rope into the walls to help lead us over the very narrow and very slippery path. this is the wall we had to climb across - and yes, that is a dog being helped along. Other than the few river crossing hiccups, the hike was pretty low key. As mentioned before, we passed through areas that were heavily shaded and lush and also some areas that were extremely exposed and dry, so bringing gear for both elements is a must. Pack on the sunscreen and bring an extra pair of... everything... just to be safe! Instead of a 2 hour hike, it ended up being more like a 4 hour hike. We arrived to the bridge around lunchtime, relaxed a little bit, ate some snacks and then began "jump school" which is basically just a 30 minute session where the guides go over all the safety protocols and different jump styles. The guides asked for two volunteers, one male and one female, to jump first. Somehow I ended up being the first and only female to volunteer - who would have guessed?! I think after such a grueling hike I just felt invincible and ready to take on the world. It's really not like me to volunteer first for anything. So after the first male volunteer went, I got strapped into my safety harness, hooked up to the bungee cord and climbed over the ledge of the bridge looking down on massive boulders and white water rapids. I only wish I hadn't been a broke 22 year old at the time, otherwise I would have jumped 10 more times. I can't even begin to explain the rush and the high you get from bungee jumping - and I didn't feel unsafe or truly "scared" for a second (not going to lie, I WAS shaking like a leaf due to all the adrenaline and the 5 hour energy I had ingested earlier that morning). I went on this hiking trip not long after I had made the decision to move to LA. I was still new, still young and very insecure about what I was really doing out here. This adventure was a real turning point. (Here comes the cheese) This trip solidified my idea that without risks there is no reward - I did something that I said I would never do in a million years and in the end had one of the best days of my life. Our hiking crew after our jumps - all smiles. 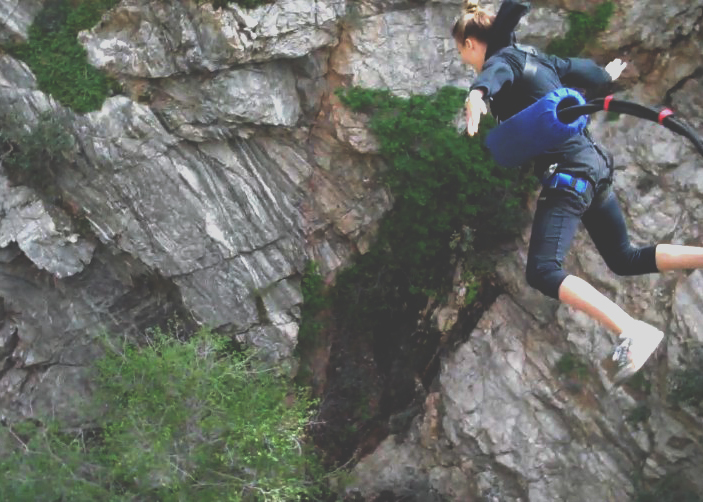 You can obviously do this hike without the bungee jumping. The trail is pretty well marked, and there are grounds near the beginning of the hike for camping - but I recommend joining the Bungee America crew, they were great guides, and if you run into any unpredictable situations like we did, you'll be much safer. Again, I recommend bringing an extra pair of everything (shoes, socks, pants, shirt etc.) and definitely bring a swimsuit or other waterproof gear - there are some great pools of water you can take a dip in along the way. I also suggest (again) layering on the sunscreen and bug spray. 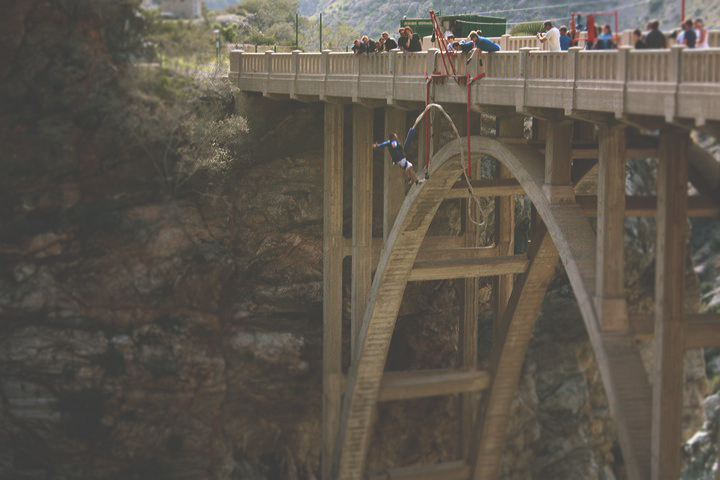 Whether you want to bungee jump or not, the Bungee America website has some great information on the overall hike and what you should pack and be prepared for. How To Get To The Trailhead: From the 210 freeway in Azusa, take exit 40 north on Route 39. Drive about 11 miles north. You will pass the East Fork Ranger Station at the base of the San Gabriel Mountains. Then continue up after the San Gabriel Reservoir and turn right on East Fork Road. After about 5 miles, the road will make a sharp bend to the right, continue straight ahead on Camp Bonita Prairie Forks Road, staying along the river for an additional 3/4 of a mile until you reach the trailhead parking area. Now go do this and tell me about how much you loved it afterwards!